A slight chance of showers between 7pm and 8pm. Mostly clear, with a low around 38. North northwest wind 7 to 15 mph, with gusts as high as 22 mph. Chance of precipitation is 20%. Increasing clouds, with a high near 61. North northwest wind 6 to 8 mph becoming east southeast in the afternoon. A chance of showers before 1am, then showers likely and possibly a thunderstorm between 1am and 4am, then showers likely after 4am. Mostly cloudy, with a low around 44. Breezy, with an east southeast wind 10 to 18 mph, with gusts as high as 26 mph. Chance of precipitation is 60%. New rainfall amounts of less than a tenth of an inch, except higher amounts possible in thunderstorms. Please view the link below to see all the details about the 2018-19 Sports Banquet. Please use the link below to view the order of events for the Track & Field Meet at Humphrey on Wednesday, May 1st. Please use the link below to view the order of events for the 2019 EHC Track & Field Meet in Tekamah-Herman on April 27th. Happy Easter! Hop into Technology! Mr. Volquardsen’s 7th grade reading group is currently studying poetry. After reading three poems about dreams, they had to write their own poem about their dreams and present it via Flipgrid. They then watched each others poetry videos and silently voted on their favorite. The winner of the poetry contest was Lillian. Mrs. Kabe’s 2nd graders used a template from Seesaw to write words with prefixes and suffixes. Tomorrow we will use it to learn about Easter Around the World and fill out a KWL chart Seesaw provided. On move up day the first graders will be writing and drawing a picture of their future selves using Seesaw, to read on their first day of 2nd grade. The 7th Graders are using imgflip.com to create Memes to welcome the 6th Graders on Move Up Day. Here is Mr. Bachman’s example:). Some 6th grade students in S.S. found a new presentation website called Emaze https://www.emaze.com/ . Students are testing it out, but what we know about it now, it is a good one! They are writing a report about South America. * That is great that Leigh students are finding their own free tools that work for them! Great work 6th Grade!! https://snake.googlemaps.com/: Snakes on Google Maps: Geography fun with an old school game!! https://www.mentimeter.com/: Class Survey Site: You will have to pay for this site after so many uses but if you delete your surveys it can be free. https://genial.ly/interactive-content-education: You can use this site like a Thinglink for free. https://jakemiller.net/docspopup/: Add a pop up on student Google Docs with a message. The Clarkson-Leigh FBLA chapter attended state leadership conference on Thursday April 4, 2019 through Saturday April 6, 2019. FBLA is an organization that helps future business leaders learn skills and techniques to run successful businesses and give all students a chance to compete for a spot at nationals. This year the Clarkson-Leigh chapter took 16 members and 2 advisors. The opening ceremony began on Thursday at 1:00. The attendees listened to a speaker by the name of Holly Hoffman from the popular television show Survivor. This year's theme at FBLA was create, lead, and inspire. Students competed in events on Thursday evening and Friday all day. At the second general session on Friday April 5, 2019, honorable mention awards were given to those that placed 9th through 20th. Noah Holoubek received honorable mention in Database Design and Application and Emily Loseke received honorable mention in Advertising. The Clarkson-Leigh FBLA chapter also received recognition for their contribution to the March of Dimes Organization. March of Dimes is an organization that supports premature babies and their mothers. Clarkson-Leigh received 3rd place out of every chapter raising $846.01. They also received the Triangle of Excellence Award over every other chapter by writing articles to describe their contributions. Saturday was the big day for awards that would determine who went to Nationals. We had many people qualify. In order to qualify you had to get 3rd or higher out of the 8 on stage. Kaegan Held, Sara McEvoy, and Paige Moore earned 3rd in Graphic Design. Noah Holoubek earned 7th in Cyber Security, 2nd in Introduction to Information Technology, and both him and Mitchel Beeson earned 1st in Mobile Application Development. Emily Loseke got 6th in Help Desk. Nationals are being held in San Antonio, Texas from June 28-July 2, 2019. Kaegan Held, Sara McEvoy, Paige Moore, Noah Holoubek, and Mitchel Beeson will be attending Nationals this summer. January 25, 2001, was a day of smiles for Russ and Beth Kuhr as they welcomed their first daughter, Holly Beth Kuhr, into their family in Columbus, Nebraska. Holly has two older brothers, Zach, age 23 and Ben, age 22, and a younger sister, Brianne, age 12. The Kuhr family also wouldn’t be complete without their dog Chipper. Holly has many favorite things. Her favorite subject in school is science. Her favorite movie is Son in Law, her favorite restaurant is Texas Road House, and her favorite sports team is the Nebraska Cornhuskers. Outside of school, you can find Holly doing something outside, playing cards, or playing volleyball with her sister. When asked who she admires most in the world, Holly would say her parents because they are very fun people and are always supportive. Throughout high school, Holly has been involved in volleyball, One-Act, FFA, and speech for four years; yearbook, journalism, and Quiz Bowl for three years; and golf for one year. Holly has received honors in many activities. She has been honored as a Cornhusker Girls’ State graduate, served as an FFA chapter officer for 3 years, received Student of the Month, earned Academic All-State honors in Music and Speech, been named an Outsanding Performer at State One-Act for 3 years, and medaled at State Speech for 3 years. 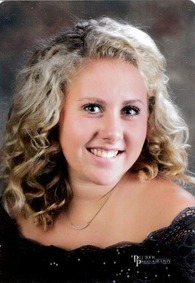 Holly will also be honored at graduation, as she is the Class of 2019 Salutatorian. With her many accomplishments, Holly says her proudest high school moment was being a lead actress in 3 of the 4 years that the One-Act team made it to the State One-Act Championships. Holly has had many memories throughout high school, but her favorite would be have to be winning the district final and being crowned district champions in volleyball her junior year. Holly also claims her most embarrassing moment of her high school career is tripping all the time. After high school, Holly plans to attend Wayne State College for 2 years before transferring to the University of Nebraska Medical Center for 2 years, majoring in Radiography. Three goals on Holly’s bucket list are to go skydiving, swim with dolphins, and travel. If she could travel anywhere in the world, Holly would want to visit Hawaii where she could lounge on the beach and drink from coconuts all day. After college, in 10-15 years, Holly sees herself working at a hospital in the area and possibly having a family. If she is fortunate enough to win the lottery, Holly intends to travel, spending the money on trips to Hawaii and Alaska. Congratulations and good luck, Holly! All Day: Golf Invite @ Pender - 9:00 a.m.
All Day: Var. TR @ Humphrey St. Francis - 11:00 a.m.
All Day: Golf Dual vs Madison @ Leigh - 1:30 p.m.
All Day: FFA Officer Interviews beginning at 6:00 p.m.
All Day: Golf Invite @ Humphrey St. Francis - 10:00 a.m.
All Day: PK Open House @ Leigh Elementary 5-6:30 p.m.
All Day: FBLA Chapter Meeting - 6:30 p.m.
All Day: EHC TR @ Tekamah/Herman - 10:00 a.m.
All Day: Golf Invite @ Pierce - 9:00 a.m.